During the first scene of Wednesday's Modern Family, Gloria (played by Sofia Vergara) was wearing this black and white ikat dress that nearly made my eyeballs pop out of their sockets. It is GORGEOUS! I love the shape, the neckline, the little sleeves, and of course, the pattern! Like the ikat bikini, I'm having an impossible time finding this on my own despite my many, MANY google searches. Pretty please help me find it! On another note, do any of you dress like that at family barbecues? UPDATE: Thank you so much Connie for finding out that this dress is DVF!! And it's on sale! a lot of you seemed to like these teal chino shorts I posted the other day. 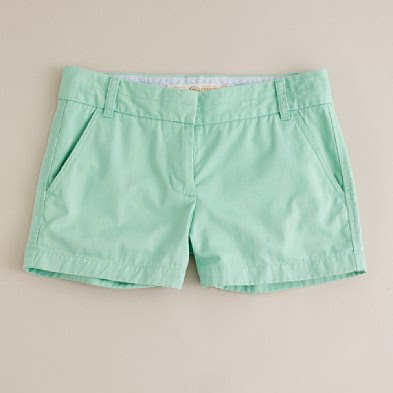 Well they are now 20% - along with all other shorts - at jcrew.com through Sunday! Sorry I wasn't able to help you out on this one, Kaz, dresses aren't my thing. ...wait, bikini's aren't my thing either, but I digress. Glad someone hooked you up. Hi Alaina! I LOVE that show, but missed it Wednesday night, and unfortunately missed the dress - argh! It is gorgeous, though, I haven't actually seen ikat in clothing, just interior design. So glad you found it, and on sale! Wow! Anyway, I'm a new follower! Have a lovely weekend, and if you get a moment, pop by and check out my Catherine Deneuve giveaway! Cheers! Lulus has a great alternative as well, as soon as i saw it I HAD to send the link to you! It's not the same cut, but definitely the same print. I've ordered from there before and have really liked the quality and service. PS i'm a new reader, but have really enjoyed your blog!